In recent months SATCOM-related cybersecurity events have taken center stage. Most visible was the º background provided by the government about the orchestrated disruptions of the Landsat 7 and Terra imaging satellites. More recent was the Pentagon and NASA breach by Romanian hacker TinKode who allegedly posted to the Internet an image of files related to confidential satellite data from Goddard Space Flight Center. With the Afghan National Security Force (ANSF) leading its first missions against the Taliban in Helmand, Giles Peeters considers the primary communications concerns for the departing NATO forces and the ongoing ANSF operation. INTEL: Implementing The National Security Space Strategy, by C. Robert Kehler, General, U.S.A.F. The U.S. approach to implementing its national space policy will determine its future course in space. Will our nation act as a collaborative partner that leads by example? Or will we try to move forward unilaterally in space? What steps should the United States take today to ensure security in space for the future? General C. Robert Kehler, the commander of U.S. Strategic Command provides his perspective on the implementation of the National Security Space Strategy as a means to promote international cooperation, establish norms, and provide mission assurance for space-delivered assets vital to U.S. leadership. Intel: Satellite Interference: The Good, The Bad And The Ugly, by Jeffrey C. Chu, Co-Founder and CEO, Glowlink Communications Technology, Inc. 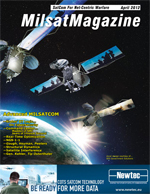 The history of U.S. MILSATCOM has been one of aggregation of mission capabilities over time. The result has been todays limited number of large satellites of ever-increasing complexity. Core U.S. MILSATCOM will span just 14 satellites by 2020 [Advanced EHF (AEHF): 4, Wideband Global SATCOM (WGS): 6, Mobile User Objective System (MUOS): 4]. Though new capabilities have been fielded and proven valuable, the consequences of this approach have been profound, resulting in fewer assets, increased cost and schedule uncertainties, and increasing delays in the fielding of new capabilities to support the warfighter. Recent budgetary constraints combined with program performance issues have forced a reevaluation of future requirements, procurement approaches, and technology roadmaps. Mr. Madden entered the Air Force in 1980 after graduating from Virginia Military Institute. He has gained vast experience in systems engineering, technical intelligence, command and control and space systems requirements, development, fielding and operations. In addition, he has commanded a Space Operations Squadron, a Material Acquisition Group, and most recently, the Global Positioning Systems Wing. He retired from active duty in the rank of colonel and entered civil service in 2010. Kay Sears, President of Intelsat General, is responsible for implementing the companys strategic and operational plans and for the overall mission of providing a range of sustainable, cost-effective and secure communications solutions to government and commercial customers. RECON: A Heritage Of Successful Missions, Comtech AeroAstro brings more than 20 years of experience in small satellite development to the marketplace. In a world seemingly gone mad at times, our nation&#146;s and our allies&#146; armed forces and government agencies are, nowadays, even more dependent upon the intelligence, surveillance and reconnaissance data beamed to them by various MILSATCOM satellites. Retasking flexibility, observation without detection, and the delivery of near-instant communication and data are just three reasons for the continuance of satellite build programs that result in saved lives and operational successes. On February 14, 2012, President Barack Obama signed a new Federal Aviation Administration (FAA) reauthorization bill worth just over $63 billion, mostly intended for FAA funding to create a new national navigation system for both commercial aircraft, such as jetliners, as well as private aircraft. The intended outcome is to switch the nations air traffic control system from older radar systems to newer satellite-based Global Positioning Systems (GPS), enabling more efficiency and safety management procedures.